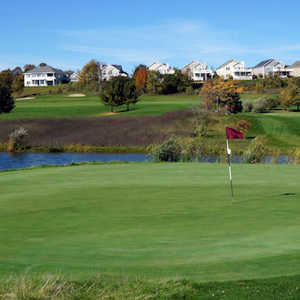 Grand Traverse Resort and Spa stands as a model of the successful marriage of gaming, golf and family resort facilities. The three courses on the property -- Spruce Run, The Wolverine and The Bear -- are mainstays of the northern Michigan golf scene. And the resort is just as much fun for non-golfers, with beaches, good food and a great spa. Grand Traverse Resort and Spa successfully blends gaming, golf and family resort facilities. TRAVERSE CITY, Mich. -- A strong case can be made that the Great Lakes region is a North American Nirvana. Aside from cold, snowy winters -- and mosquitoes -- conditions and surroundings are ideal: plenty of water, abundant fish and game, rich soil, and no hurricanes, earthquakes or tsunamis. This is how the land that is now most of Michigan was viewed for millennia by the Anishnaabeg, the original inhabitants comprising the Odawa (Ottawa), Ojibwa (Chippewa) and Bodowadami (Pottawatomi) -- the people of the Three Fires Confederacy. These American Indian tribes ceded the land through a treaty in 1836 (and Michigan was established as a state in 1837). For the next 144 years, the tribes were marginalized and ignored. Services promised in the treaty were not provided, and the tribes were even falsely deemed to be no longer existent until 1980, when the Grand Traverse Band of Ottawa and Chippewa Indians was recognized as a Tribe. After the landmark 1976 Bryan vs. Itasca County U.S. Supreme Court decision, which determined that American Indian tribes had the right to self-governance under federal treaty and were not bound by state laws, tribes began erecting bingo halls to raise money for services that were not being provided by the U.S. government. The Grand Traverse Band was one of the first to build a bingo hall -- the Super Bingo Palace -- in 1984. Since then, the Grand Traverse Band has been the first to do a lot of things right, including the first to purchase an existing golf and spa resort to diversify gaming operations. Grand Traverse Resort and Spa was purchased in 2003 from KSL Recreation Inc. by the Tribe, and renovations and improvements have been made constantly ever since. More than $1 million of casino revenue goes into upgrades of the facilities each year. Now resorts from Connecticut to southern California have focused on golf as an integral part of their holdings. And Grand Traverse Resort and Spa stands as a model of the successful marriage of gaming, golf and family resort facilities. The three courses on the property -- Spruce Run, The Wolverine and The Bear -- are mainstays of the northern Michigan golf scene. The original course, Spruce Run Course, is a 6,300-yard Bill Newcomb design, which hosted the Michigan Open prior to the opening of the Bear Course. If you're planning on playing all three courses, this would be a good one to start with to get warmed up. Next on your itinerary should be the Wolverine Course, a 7,043-yard Gary Player gem that looks wild but plays like a prototypical resort course: A nice, gentle few holes to start out, lots of mounding to keep all but the most errant shots in play (or at least findable), and drop areas on the other sides of forced carries, just in case things don't go so well. The Wolverine does have some teeth, however. Most of the fairway bunkers are wooly edged, surrounded by thigh-high and thick fescue. So you'd rather be in the sand than just out. My favorite holes are No. 5, a long par 3 over what seems like nearly endless trouble, and 16, a long par 4 with an uphill tee shot to a mostly blind landing area. The best line here is over a massive oak tree at the crest of the hill, if you can get over it (I was so very close), otherwise play out to the left and leave yourself some 200 yards downhill to the green. The Bear is the king of Grand Traverse Resort. It is a bruising 7,078-yard beast loosed by Jack Nicklaus in 1985. It has hosted numerous Michigan Opens and was rated as the most difficult course in the state for over a decade. Many holes feature fairways with a sort of "shelf" on one side or the other, forming a steep drop-off. Stray shots that wander off these mini-cliffs will be tricky, though not impossible, to get to the greens. One favorite hole is No. 3, a long but relatively gentle par 5 with a kidney-shaped green huddled into a hillside, surrounded by trees and fronted by a creek -- the most peaceful, idyllic spot on the course. Another favorite is the closing hole, a long par 4 where a strong drive leaves about 170 yards away from a shallow, wide green. All you have to do is traverse the pond in front of the green and keep out of the bunkers behind it -- and then go into the clubhouse for a soothing drink. Despite its difficulty and length, there are many holes on The Bear where driver is not the best choice. Pulling the right stick is made more difficult because several shots -- off the tee and from the fairways -- are blind. Save this course for last, as it can be demoralizing. And don't play it alone -- all those blind landing areas make it very hard to follow, and find your shots, even the ones you hit on line. If you want to work on your game, the newly opened Grand Traverse Resort Golf Academy has taken the place of the former Jim McLean academy that was on site. The new academy is overseen by Michigan golf legend Scott Hebert. Among many other titles, Hebert won the 2008 PGA Professional National Championship and six Michigan Opens. Heated hitting bays and top-of-the-line electronic swing analysis equipment allow for year-round instruction and practice. Finally, given that there are so many courses in the Traverse City area, the resort can set up rounds for you at several local courses. For example, Lochenheath Golf Club is right across the street. 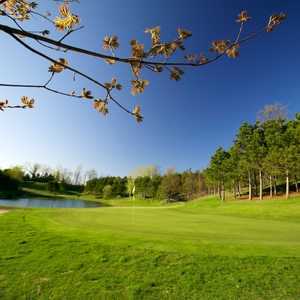 Grand Traverse Resort is just as much fun for non-golfers. A collection of shops in the newly renovated lobby area include a wine shop, a toy story, apparel shops and my kids' favorite, Dylan's Candy Bar and Dylan's Candy Cafe. The latter features ice cream and chocolates made on site, guaranteed to trigger sugar-shock. A five-minute shuttle ride will take you down to the Michigan Beach Resort, where you'll find an outdoor pool, bar and grill, white-sand beach and watersport equipment rental. Grab a kayak and spend a couple hours paddling around Grand Traverse Bay, or bounce around on one of the floating water trampolines. Another shuttle ride takes you to the the Tribe's "zhoonyaataagegamikwag," Turtle Creek Casino and Leelanau Sands Casino. Both casinos now also have lodging on-site, in case you'd rather stay closer to your money after you've lost it. At the main resort, families will find both indoor and outdoor pools, and tennis courts among several other recreation options. The Grand Traverse Spa is understated but luxurious and was, to my knowledge, one of the first to offer now-omnipresent "hot rock" massages. My favorite is the two-hour Golfer's Recharge Spa Package ($160). Traverse City is my personal favorite family vacation destination in the Midwest. You have lots of beaches, a recently enlivened restaurant scene (you MUST visit Pearl's in Elk Rapids for the Cajun food), numerous pubs serving up the beers of local breweries and suds from throughout Michigan (one of the best beer states in the nation), and a thriving art scene. Hop in the car, and you are only a few miles from both Leelanau and Old Mission Peninsulas. These fingers of land poking out into Grand Traverse Bay are home to dozens of vineyards and wineries, B&Bs and quaint general stores. For some of the best wine and best views on Old Mission Peninsula, visit Chateau Chatal either on the way up to or back from the historic Mission Point Lighthouse. Madonna's parents have a winery on Leelanau Peninsula, and another lighthouse, Grand Traverse Lighthouse, is worth a visit. Take a ferry from Leland out to North or South Manitou Island for a romantic, secluded picnic. Also only 20 minutes away from Traverse City lies the Sleeping Bear Dunes National Lakeshore, which was awarded the title of "Most Beautiful Place in America" by viewers of "Good Morning America." Climb 400-foot sand dunes and then barrel roll back down before jumping into the crystalline waters of Lake Michigan. Every time my family and I go to Traverse City, we leave with a long list of things we simply didn't have time to do. One could fill many summers with golf, wine food, and fun in the Traverse City area. It's easy to understand why the people of the Three Fires Confederacy have been here so long and are working hard to both keep it as their own and share it with visitors. A quick clarification is in order. The $1 million in yearly upgrades to the GTR actually comes from the resort's revenue stream, rather than the casinos. The casino revenue enable the Tribe to purchase the resort originally, but now the resort funds itself (although occasional renovations get special dispensation from other revenue streams).